If you’ve been to an audiologist for hearing tests, and they have recommended using hearing aids, you may be approaching a hearing aid fitting with both trepidation and excitement. It’s natural to be slightly nervous about wearing hearing aids for the first time, but you’re probably also really looking forward to being able to hear again. If you’ve got your hearing aid fitting coming up, here are 4 things to expect. A hearing aid fitting has multiple functions. One of the most important aspects of the fitting is ensuring that the new hearing aids are comfortable. If you have ear molds, they should fit perfectly, and you should be able to insert and remove them without any difficulty. When you see your audiologist, they will insert your hearing aids for you, and then ask you how you feel. If you’re not comfortable, don’t suffer in silence. The whole point of this appointment is to ensure that you’re 100% happy with your hearing aids. If they don’t fit, your audiologist can make adjustments, so don’t worry. It’s very uncommon to place a hearing aid in the ear and identify the optimal settings straightaway, and this is why a hearing aid fitting is so beneficial. When you’ve got your hearing aids in place, your audiologist will modify them and adjust the settings to see how you respond and identify which programs and power levels are best for you. 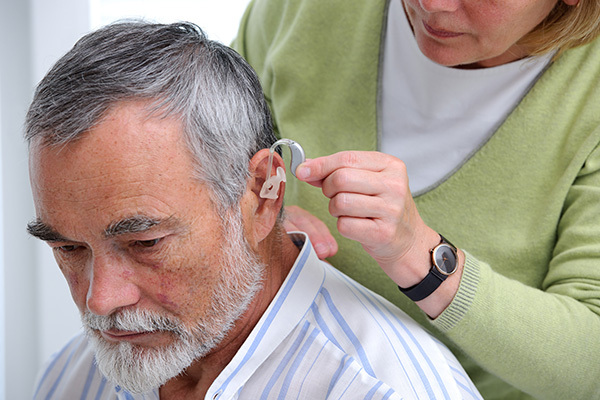 Your audiologist will carry out some tests to make sure that you get the best out of your hearing aids. When your audiologist has programmed your hearing aids, they will show you how to adjust the settings yourself, how to insert and remove the devices and how to care for your hearing aids. They will give you practical demonstrations, and you can ask questions along the way. Your audiologist can also give you information sheets to help you when you get home, and you can always call if you have any problems or queries. Your hearing aid fitting is the first time you’ll get to try out your new hearing aids. When you first use your hearing aids, be prepared for a bit of a shock. Many people find that the sound of their own voice is different and they may also hear a tinny sound when they listen to high-pitch noises. Your audiologist will play you a range of sounds and tones to see how you respond with your hearing aids, and they can adapt the settings to improve the clarity and set the volume at a level you’re comfortable with. Hearing aids can make an incredibly positive difference to your hearing capabilities, but it’s so important that they are fitted correctly and that you feel comfortable and confident. A hearing aid fitting is essential to check the fit of the hearing aids, but also to ensure that your hearing aids are personalized and that you know exactly how to use them and take care of them.